“Can cats eat eggs?” You probably ask this question if you want to share some of your breakfast with your kitty, if you want to give your cat a special treat, or if you want to change your cat’s diet. Humans eat eggs in all kinds of meals, so is it safe for cats to eat eggs? The answer to that question is yes, cats can eat eggs in moderation, though you must ask your veterinarian before you feed eggs to your cat. There are many situations where eggs can be harmful to cats, and eggs should really only be given as a sometimes treat. 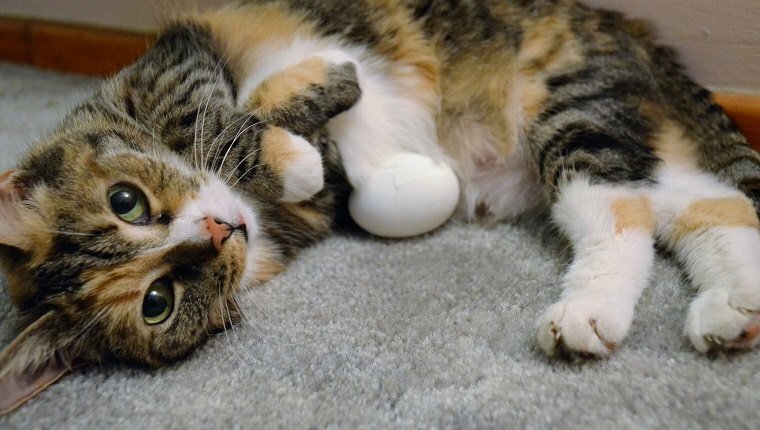 Here is what you should know about feeding eggs to cats. How Are Eggs Good For Cats? Eggs are full of protein and amino acids that are good for cats. The protein in eggs is easy on the digestive system, and amino acids help cats maintain lean muscle. Eggs also contain vitamins, minerals, and many nutrients that benefit cats’ health. They can be especially good for helping malnourished or underweight cats put on some extra weight. However, before you go feeding your cat eggs with every meal, you should know that eggs are only good for cats in moderation, and too many eggs can make your cat very sick. There are also several situations where eggs may actually be harmful for cats to eat at all. When Are Eggs Bad For Cats? 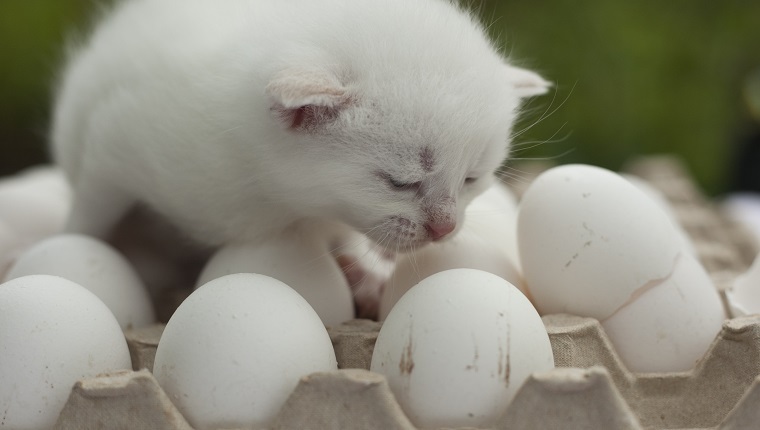 While eggs can provide cats with plenty of nutrients that they need, too many eggs can cause serious health problems. Additionally, some cats shouldn’t ever eat eggs. That is why it is so important to consult your veterinarian before feeding your cat eggs or any human foods. 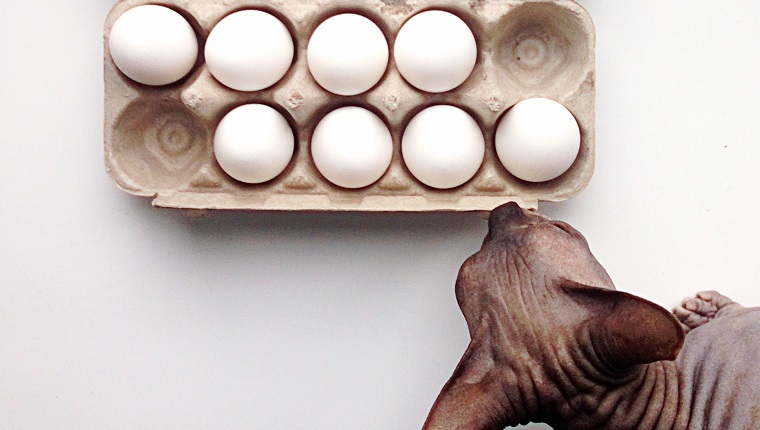 Here are a few situations where eggs may be bad for cats. Over-serving. Eggs are high in fat, cholesterol, and calories. It doesn’t take a large serving to fill all your cat’s nutritional requirements for these substances. Furthermore, too much protein can lead to kidney issues in cats. Eggs are not nutritionally balanced for cats and should only be a supplement or treat that is part of a healthy diet. Too many eggs can lead to obesity and other health problems. Allergies. Eggs are a fairly common allergy among cats, and you may not know if your cat is allergic to eggs until they eat some. If your vet gives you the okay, try feeding your cat just a taste of eggs at first. Look out for signs of itching, swelling, coughing, or digestion problems. If your cat shows symptoms of an allergic reaction, do not feed them eggs again. Medical conditions. Certain medical conditions like obesity, kidney disease, and other health issues may be worsened when cats eat eggs. Ask your veterinarian if your cat is healthy enough to eat eggs before you try feeding them to your kitty. How Should I Feed Eggs To My Cat? One of the reasons you must consult your veterinarian before giving your cat eggs is that it is difficult to tell what a healthy serving of eggs will be for an individual cat. An appropriate serving size will depend on your cat’s weight, age, diet, and overall health. With that in mind, here are a few general guidelines when it comes to feeding eggs to cats. A full egg is too much. One egg for a cat is the equivalent of about eight eggs for a human. If you are giving your cat a full egg, it is likely going to be way too much for them and can make them sick. Not an everyday treat. Eggs should not be fed to cats every day, as they are not nutritionally balanced. They should only be given as a sometimes treat about once per week at most. Raw eggs can be dangerous. Many pet owners see benefits from raw diets, however raw eggs can contain E. coli and salmonella. While healthy cats are unlikely to suffer from an infection, cats with compromised immune systems are more at risk. These bacteria can also infect humans. Raw eggs also contain a protein that may make it more difficult for your cat to absorb biotin, a vitamin essential for skin and coat health. Your cat would likely have to eat a lot of raw eggs regularly to be affected, but it is important that you know the risks and discuss them with your vet before giving your cat raw eggs. Avoid salt, sauces, spices, and additives. Eggs are best for your cat when they are plain. Added cheese, garlic, salt, onions, sauces, or other ingredients commonly added to eggs can be toxic for your cat or give them an upset stomach at the very least. You can serve your cat fully cooked eggs any way you like. Scrambled, poached, or hard-boiled are all fine choices, and many owners mix the egg in with their cats’ regular meals. 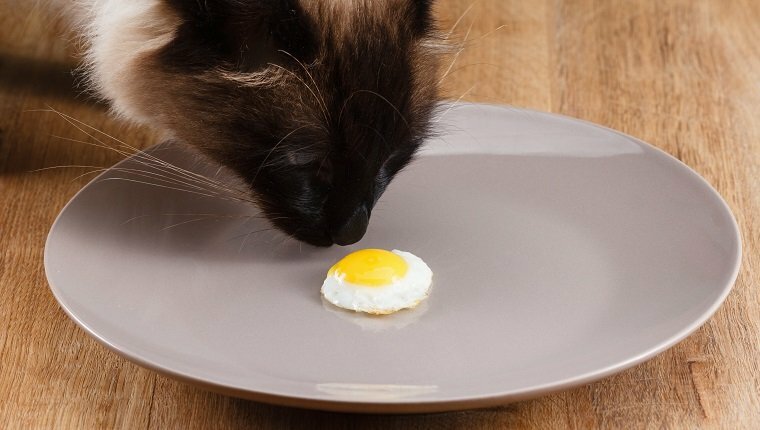 Egg whites are lower in fat and likely to be more nutritious for your cat, but they can also eat the yolk in moderation. Watch your cat’s calories, too. Eggs should probably not make up more than ten percent of your cat’s calorie serving for the day, but your veterinarian can give you more specific guidelines. Do you ever feed eggs to your cat? What other safe human foods does your kitty get to share with you? Let us know in the comments below?